Over the past weeks, if one observes closely, the summer sun has been making it’s last appearances before it heads south. It pokes it head behind the clouds and we all step outside to soak in the rays that, for those staying in the northern hemisphere, will not see for a while. The sound of the kettle boiling, the increase in tea bags being used, blankets coming out of closets in the common room are all signs of preparing for cosy Autumn days. 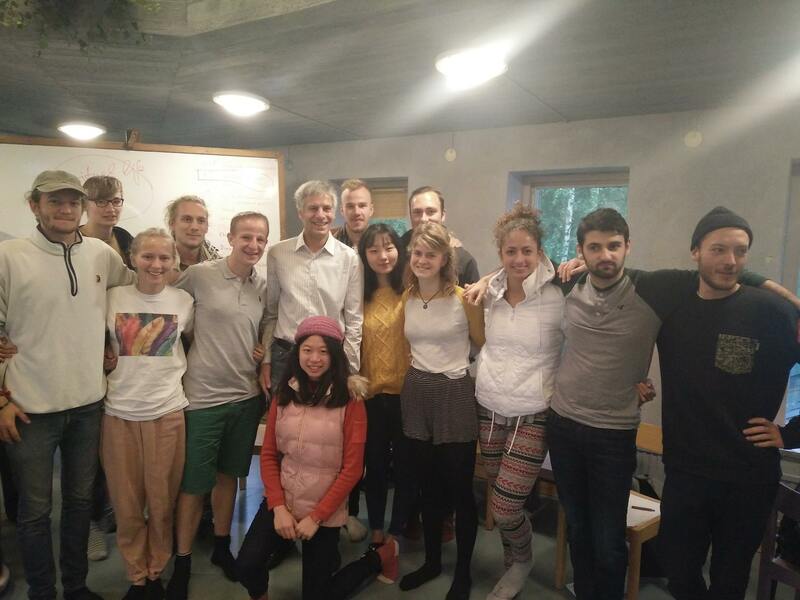 During our week with Gerald Häfner we tried t o understand and discuss the questions concerning the subject of good “Politics & Governance”. We talked about a lot of things, asking ourselves many questions. Talking trough the flaws of our current political system, trying to understand how our society works, while trying to come up with ideas to make it work better. It was a long listening week. Gerald brought a lot of knowledge and content and invited us to partake in many discussions. This week also brought a lot of differences and some of us again realized and met our privileges face to face. There is a big difference how people look at politics in the world, having a contributor from the “western part of the world” made us realize that not everyone has the privileges or the same perspectives as we Europeans, or Americans have. It was important to realize that diversity of the world’s challenges. It made our perspective much more global. But more or less, this week offers us the privilege of time to spend with a person who in a sense embodies the work he does and believed truly in it. In the last week of September, Kailea Sonrisa, born into an indigenous community in Maui, Hawaii, was here to share her understandings of spiritual ecology with us. The course she gave is part of her initiative ’Earth is `Ohana’, an immersive educational framework, aiming to reconnect us with the spaces we inhabit, with earth, nature, and ourselves. Kailea shared essential and potent information with us, describing the whole scale of the global crisis we are facing. We discussed the reality of climate change and its sensible impact on our life and that of our communities. We learned about the concept of planetary boundaries, resilience building and the core principals of spiritual ecology. Most of all, the week with Kailea was a journey into ourselves, a quest for meaning, and a rekindling of our connection with the earth, with nature. All the moments of silence and reverence, of sharing our stories and even walking blindfolded through nature, made this course truly meaningful and memorable. In these two months, Tallevanna has become our home (and we’ve begun calling it as such). We’re still experiencing and experimenting how to live together. It’s a community forming, including house meetings every two weeks. Topics range from broken toasters to the banana issue, and the constantly mentioned: “please just clean your dishes”. Also quiet is occasionally difficult to find. There’s constant chatter in the hallways, or doors creaking on their hinges as they’re swung at midnight. But there’s peace here, regardless of all the clamouring. I’m looking through our windows, at the trees and the ever-changing clouds. This is our safe place, a space to form however we choose, inhabit as we see fit and come into as we are. This is a house shared by unique individuals, a place for change makers and shared ideals. Yet most of all, past the pink and blue exterior and the mountain of books piled on the piano, this is our home. Entering the YIP community, for me, is a whole new experience in every way. We are fully engaging with our bodies, minds and hearts. We are testing our concepts of freedom and power through initiative. I feel so much gratitude for being in this space, and yet it is still challenging for me to comprehend that this space exists at all. As my body has been consuming organic foods, which are also more locally sourced and intentionally vegetarian than my body was exposed to back home, I have appreciated getting more in touch with the feeling of a consistently healthy diet. The fresh air and beautiful nature surrounding us throughout Jarna make me feel welcomed and refreshed by each morning here. Our educational processes in the courses strive to acknowledge and incorporate our sense of physicality as well, whether it is outdoor meditation, social dancing, or even just sitting in a circle during lectures. This allows me personally to feel more liberated during courses to work both intellectually with my mind and emotionally with my heart. I may carry a different purpose here than each of my peers but we all are striving to use what we are learning to feel free as individuals and develop ourselves towards our potential. The organising team has provided us with a platform. 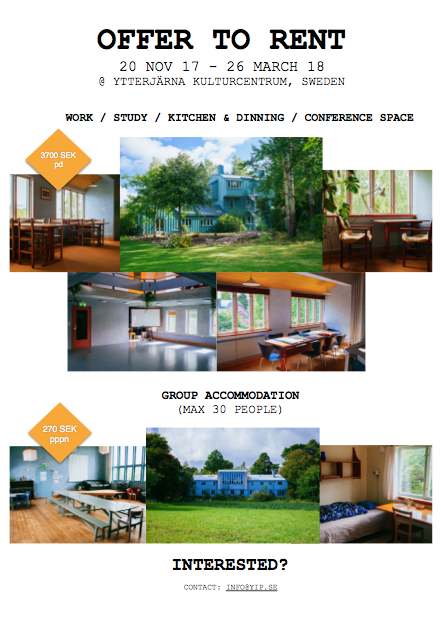 They have brought together a cohort of 29 curious young people, a set of experienced and world-wise contributors, and a beautifully developed physical environment. From there, the power and responsibility to utilise this platform is placed in our hands. For myself and I think many others, this holistic sense of empowerment is at once overwhelming and inspiring. As we adjust to this new way of living, we are becoming more and more comfortable embracing the latter. One week vaca tion. No plans, no other countries to visit, only a lust for adventure and eight other people to share this with. After long meetings spent scatterley deliberating, we finally decided to head out to Mörkö, an island about 15 kilometers from Ytterjärna. On the Wednesday morning of our break, we spent time distributing food supplies (which mainly consisted of apples, jars of peanut butter, and a lot of potatoes). Because of different needs, five of us headed out that very afternoon. The following day we would be joined by the other four. We shouldered our backpacks, took the bus to a stop before the island, and walked through the woods for hours. 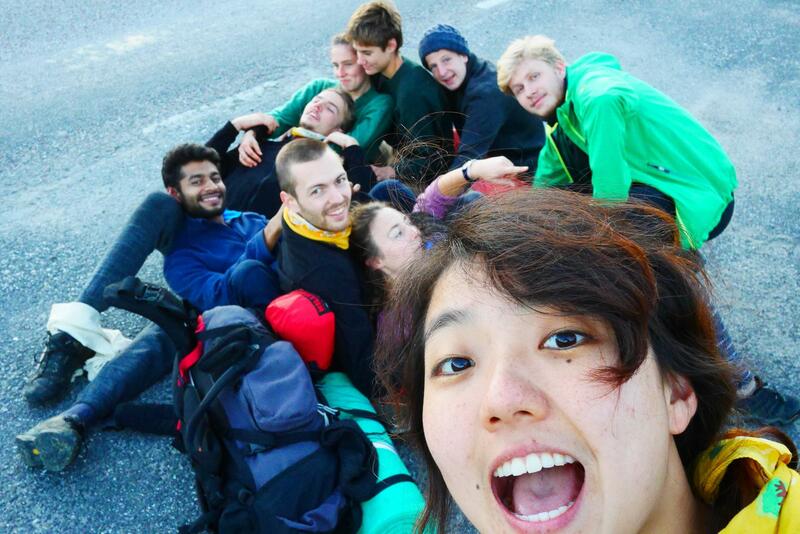 After a wet, flameless night, we met the rest of our group across the bridge to Mörkö. That day we picked bags of wild mushrooms, collected kilos of pears, and played ukulele to the trees. We walked across wetlands, crossed raging rivers (or more accurately: a meter-wide water-way), and so covered one kilometre of distance in four hours. As unsuccessful as this may sound, we trudged across the road, our shoes soaked and our faces glowing. We started a fire at our camp. As the full moon rose, we spent hours casually cooking, singing, and watching Simon beat at the mosquitoes. Long after first light we rose, and then spent our morning roasting muesli and fruits. Finally we headed off again, walking one way, looping back, climbing over moss covered rocks, and stopping for another extravagant picnic. At the end of the afternoon we took the bus back to Ytterjärna, and once back home enjoyed hot showers and baths. Though we’d only spent two night in the woods, it felt like weeks of an incredibly fulfilling adventure. We were again confronted with the beauty of the country we are in, and reminded of the peace our natural surroundings can bring us. It was the first of such trips, though the trees still call and it will not have been the last. News about IF and the 10 Years of YIP Gathering. This year the YIP program is going through some exciting changes. We have a new element to the curriculum where the whole of YIP will go to Brazil for three months from Dec-Jan, followed by the participants going on their international internship until the end of March. Because of this change there will not be an Initiative Forum in 2018. However as we will be coming towards the end of our 10th year of YIP we are organising an event to celebrate the work that has been done and to look towards the future of our community as a network. This event will happen from 1-5th August 2018 in Ytterjärna and there will be camping possibilities from 28th July- 11th August. It is going to be a very special gathering, with the hope that there will be many alumni and people connected as a part of the YIP community. As we are now a community that is already as large as Kulturhuset can hold, and as we hope and encourage all alumni to show up, we will not actively promote or advertise this event. However, we welcome those who feel a connection to everything YIP has been so far, and to those who want to be engaged in the YIP network for the years to come.